A giant fist wearing a white glove. The Big Fist punches the boss to inflict damage. The Big Fist is an item that Wario can purchase from the Item Shop in the Game Boy Advance game, Wario Land 4. It can be bought off the Item Shopkeeper, for ten medals (depending on the game mode, it could cost more). All items from the Item Shop are there to assist Wario in defeating a boss by doing pre-damage at the battle's start. When purchased, the Item Shopkeeper will follow Wario to the boss room. She will the transform into a big fist, vaguely resembling Master Hand and Crazy Hand from the Super Smash Bros. series. The fist will swing a powerful punch at the boss, although the damage varies depending on the boss, it is most effective against Cuckoo Condor, dealing twelve points of damage. 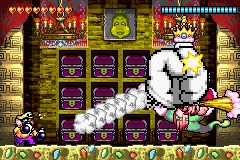 After punching the boss, the Item Shopkeeper exits the room and Wario is left to challenge a greatly weakened boss. This page was last edited on March 17, 2019, at 01:05.